This Lemongrass Ginger Syrup is a great way to preserve ginger and make it easy to us. The syrup works perfectly for marinades, as a sweetener for tea, or to make homemade ginger ale. 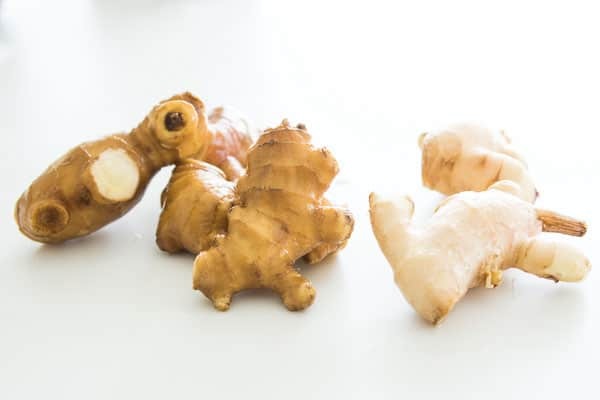 Ginger is one of those spices that you generally don’t need a lot of, but it’s hard to buy just a small piece. That’s why I like buy it in bulk and preserve it. I’ve talked before about preserving ginger in vodka, but juicing it and creating a syrup is another great way to make it last. In liquid form, it’s convenient to use, and the sugar will help preserve the ginger for months. I always have at lease one bottle of this in the fridge because it’s great to use in marinades or as a flavorful sweetener for tea and coffee. I especially like mixing this with mint tea brewed from fresh mint leaves and a squeeze of lemon juice. Added to lemonade, the acid turns the ginger slightly pink, adding a spicy zing to the classic. I’ve even been drizzling this on homemade yogurt with some toasted oats for a delicious breakfast treat. Of course the most obvious use it to make ginger ale by mixing the ginger syrup with lemon juice and seltzer water. It still has sugar, and can’t be considered healthy, but it’s certainly a better alternative than the commercial brands that are loaded with high fructose corn syrup. It’s also nice because you can control the amount of sugar in each glass by reducing the amount of syrup you add. You’d be surprised at how little you can use and still have a great tasting soda. For making this syrup be sure your ginger is fresh, and preferably young. 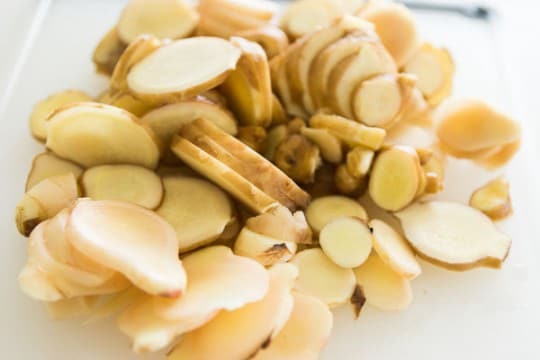 As ginger rhizomes mature, they become drier and more fibrous making it difficult to extract the juice. Both types of ginger in the photo above are fresh ginger, but the one on the left is more mature than the one on the right. In the photo below you can see what a cross section of each looks like. The more mature ginger on the left is visibly more fibrous and the skin has gone from a yellowish pink to a brown color. 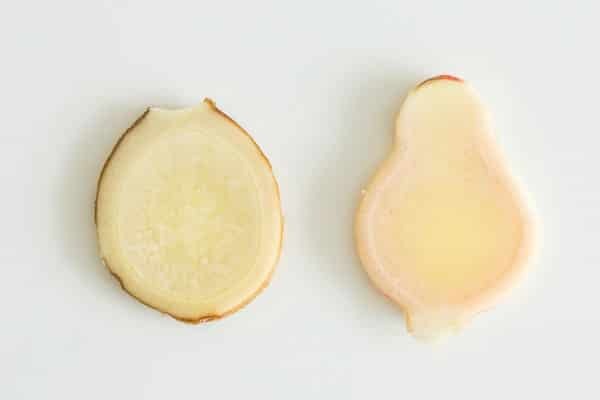 What you want to avoid, is ginger with beige papery skin as this means the rhizome has fully matured, making it nearly impossible to juice. Unfortunately, much of the ginger I’ve seen in US supermarkets is of this variety. Take a trip to your nearest Chinatown though, and you should be able to find crates of fresh young ginger for a few bucks a pound. Thoroughly wash the ginger. You don't need to peel it, but break off any hanging pieces as dirt sometimes gets trapped between nodes. Roughly chop the ginger and lemongrass and add it to a food processor along with the lemongrass and 2 cups of water. Process until the mixture is pureed, scraping down the sides a few times with a spatula. 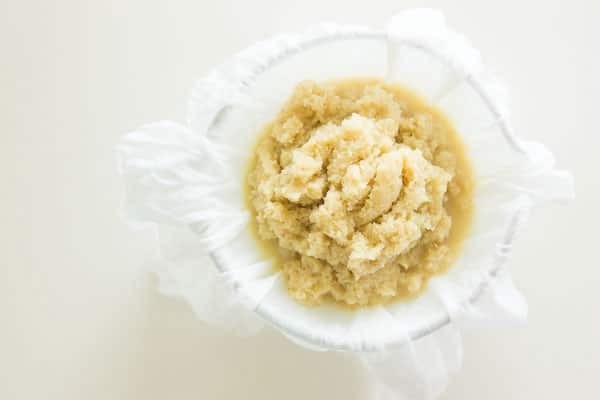 Line a 2 cup liquid measuring cup with multiple layers of cheese cloth, or a single layer of fine-mesh muslin and scoop the ginger mixture onto the cheese cloth; you'll probably need to do this in batches. Gather up the edges of the cloth and twist the edges towards the bulge of ginger to wring out as much liquid as you can. Discard the pulp and repeat until you've squeezed out all the ginger juice. You should now have 4 cups of liquid. If you don't have 4 cups, the ginger you used may have not been fresh, but just add water to make 4 cups. Add the ginger juice to a large pot along with 6 cups of sugar. Heat the mixture over medium heat to a full simmer. It has a tendency to boil over, so keep a constant eye on it and lower the temperature if it looks like it's going to boil over. 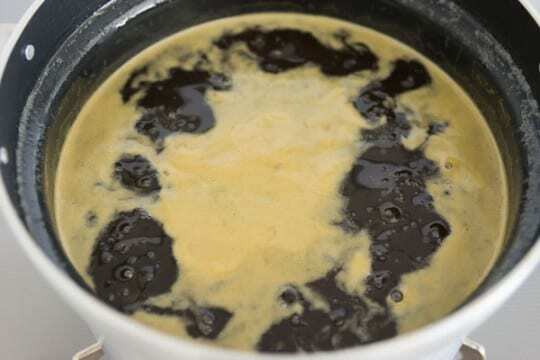 The impurities that made the juice cloudy will float to the top as foam, so use a fine mesh skimmer or spoon to remove the foam from the syrup and discard. After the foam stops forming and the syrup is clear, your ginger syrup is done. 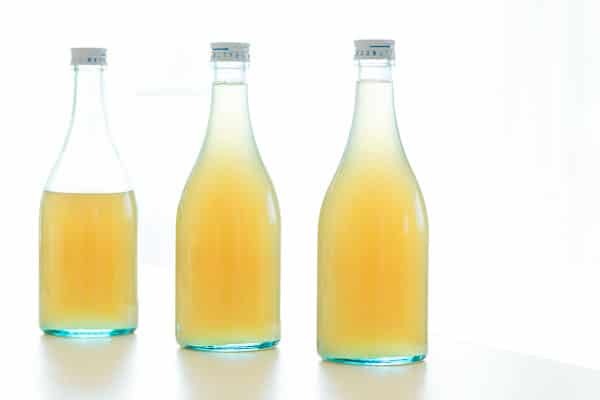 You can pour the hot syrup into sterilized glass bottles, or let it cool and transfer it to a suitable container. Stored in the fridge it will last for 6 months. Yum! This made me perk right up! Can’t wait to hit ip Chinatown for some ginger. Do you have a Chinatown near you? They almost always have produce vendors that sell fresh ginger. Great, thank you, I would definitly mix this with vodka! question on the sugar.. have you tried experimenting with natural sugars like stevia, coconut sugar, or even pure cane sugar? is your base refined sugar? what would be the difference in measurements if i were to use coconut or pure cane sugar. i think it would be less than 6cups as these are more natural and a little sweeter. I just recently found your site and i have loved all your recipes! your instructions and stories behind and lessons learned are definitely much appreciated!! Hi Nova, I don’t like using non-sugar sweeteners like Stevia because it leaves a funny aftertaste it’s also not a 1 for 1 substitute for sugar. I usually keep 2 kinds of minimally refined sugar on hand Demerara, which I use in place of granulated sugar, and Kokutou, which is a Japanese brown sugar that’s similar to Muscavado. They’re both 1 to 1 substitutes. Keep in mind that while 6 cups of sugar may sound like a lot, you’re not drinking the syrup straight. I usually cut the syrup at a 8 to 1 ratio of seltzer water to syrup. OMG. I have become addicted to lemongrass and ginger tea and have both growing in my yard, I was looking for tips on how to make tea but now I think I’ll have to make this too. Weekend just got busy. The lemongrass flavor in this is mild because some people say it tastes “soapy”, but if like lemongrass feel free to add more. Hi Marc, could you use one of those Oscar juicers to extract the juice from the ginger then add the water instead of blending it. Hi Alex, I’m not familiar with that juicer, so I can’t say for certain, but the idea sounds like it should work. Give it a try and let us know how it goes. I used a Breville Juice Fountain, and it worked very well. The resulting syrup was a bit darker than yours, but it tasted great!